Sore throat is a health problem which brings painful feelings and gets worsen once you swallow. Although it’s true that this matter can affect anyone of any age, some people are more likely to suffer a sore throat, including: people with a bad immune system, those with allergies, children, and especially smokers. Let's go with best thing for a sore throat. Viral infection: infections triggered by viruses like: flu, the cold, chickenpox or coup. Bacterial throat: infections caused by strep throat, whooping cough or diphtheria. Environmental factors: dry air, polluted air, cigarette smoke or too much talking. Gastroesophageal reflux disease (GERD): a matter which happens when acid in your stomach runs back into the esophagus and causes some health issues, including sore throat. 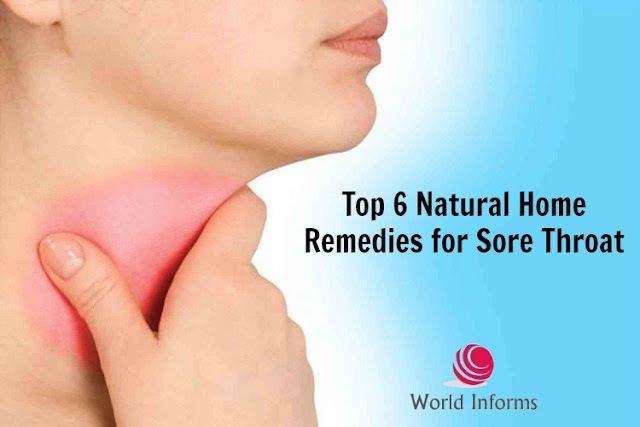 The level of sore throat varies from mild to severe but most don’t require serious medical attention. However, you are advised to see your doctor if your sore throat lasts over one week combined with following symptoms: joint pain, a fever over 101oF and difficulty in breathing. Salt water is on the top of this list as it is the easiest way to follow at home. Medically, your throats hurts because of swollen and inflamed mucous membranes cells. By gargling with salt water, your sore throat will be soon eliminated. It is because salts help draw out water then ease the inflamed cells and lessen the pain. Do this once each hour and repeat 3 times per day. Also, salt water is another good way to help you treat oral thrush naturally. For long, garlic is considered as a natural remedy which brings relieves for many health issues. In treating sore throat, the reason lies in the presence of allicin. This compound is very powerful in killing the bacteria causing sore throat. Have several cups per day as you like. Licorice root has been regarded as a popular ingredient which brings many health benefits due to its medical usages. Loading with high amount of anti-inflammatory and anti-viral, licorice root helps clear irritation and lessen the mucus membranes cells. Prepare a dried licorice root then cut it into small pieces. The next remedy in this list is a beautiful flower – chamomile. Packed with anti-spasmodic, chamomile acts as a killer of bacteria which soothes your throat pain. Combine it with some honey or lemon then drink it. You will not want to dismiss this remedy for its awesome benefits. Cloves has been widely used to eliminate pain in throat for centuries. Cloves are famous of excellent source of eugenol in its content. This substance helps ease bacteria then gives you relief for treatment of sore throat. Take 1-2 cloves and chew them until they get soft. Alternatively, you can also add 1 cup of hot water into 1-2 tablespoons of clove powder, then use this to gargle daily. The last remedy listed in this article is tomato. This red vegetable gives you relieves of many health matters, sore throat is included. Thanks to the antioxidant properties in its quality, tomato helps remove pain throat faster. Author bio: This article is written by Ashley Bennet, a co-owner of AuthorityRemedies. She has worked and trained in the field of Nutrition and Health for over 3 years, consistently providing people with useful information about nutrition as well as helping them with their common health problems.